In 1960s London, we are introduced to Jessica Speight, a young anthropology student who gives birth to a beautiful, serene baby girl: Anna. As a baby, Anna is well behaved, docile, calm, and smiling. However, as she grows, it becomes evident that she is not developing as one might expect, and Jess must confront the issue of having a child with learning difficulties, adjusting her plans for the future. The Pure Gold Baby is, in many ways, a quiet sort of story. This is not meant as criticism. Indeed, as a newcomer to Drabble’s writing I was immediately taken by the ease and perceptiveness of her prose. Her work feels effortlessly precise and skilled. The quietness of Drabble’s latest work is more to do with the subject matter, as the story follows the arc of Jess and Anna’s lives, exploring changing attitudes to mentally disabled children, as well as broader socio-political shifts, and capturing an era in transition. Told through the eyes of a friend and neighbour the story has a voyeuristic quality, feeling somewhat removed from the immediacy of the experience. This works well as a lens through which to explore a variety of far-reaching themes such as motherhood, friendship, and family. As Anna grows, the reader feels they are watching the ebb of Jess’ life with her daughter, through difficult decisions, love affairs, and friends who need caring for. The one constant and unchanging factor is Jess and Anna’s relationship to one another. Jess makes for a strong and devoted protagonist; a woman to admire. 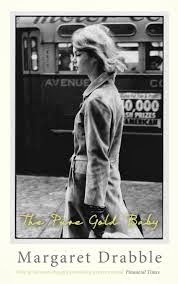 The Pure Gold Baby is an intelligent, insightful novel which makes for a rich and rewarding reading experience.